The seven locks still in use can be seen at the left edge of this map, the two disused are the direct continuation of that line towards the River Orb. 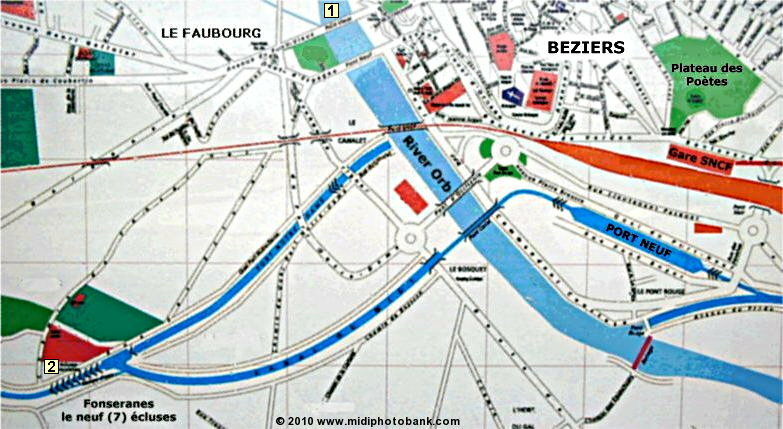 Boats used to enter the river, turn right and re-enter the canal system towards the right of the map, beyond the "Port Neuf". Craft now turn right after the seventh lock and cross the river by the "Pont Canal" and enter the "Port Neuf" via a deep lock at the eastern end. There are restaurants and bars alongside the port and good moorings. © 2000 - Sysnix Consultants Ltd. -- All Rights Reserved.